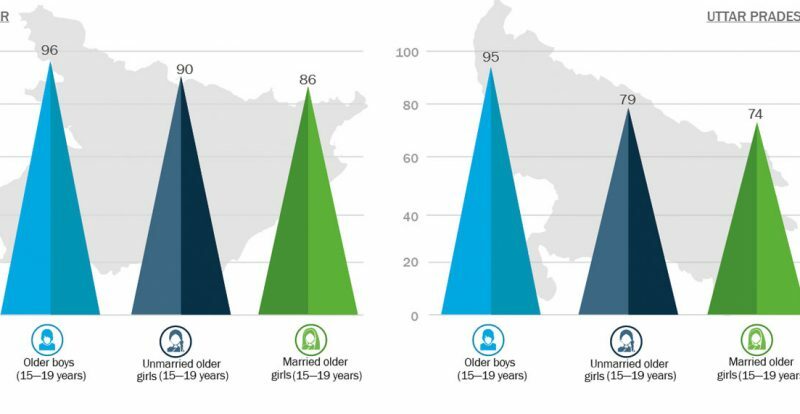 Adolescent girls and boys navigate changing roles and expectations as they transition to adulthood. Several adolescents experience hurdles to realizing their full potential, with limitations on their freedom of movement and their ability to participate in organized groups. UDAYA examines adolescents’ agency, autonomy, and participation in community organizations/ democratic institutions. Boys, compared to girls, had more control over their own decisions. They were given more freedom to decide on their choice of friends, their schooling, household purchases, and their decision to work. The freedom to visit places like a shop or a friend’s or relative’s residence varied by age, gender, and location. 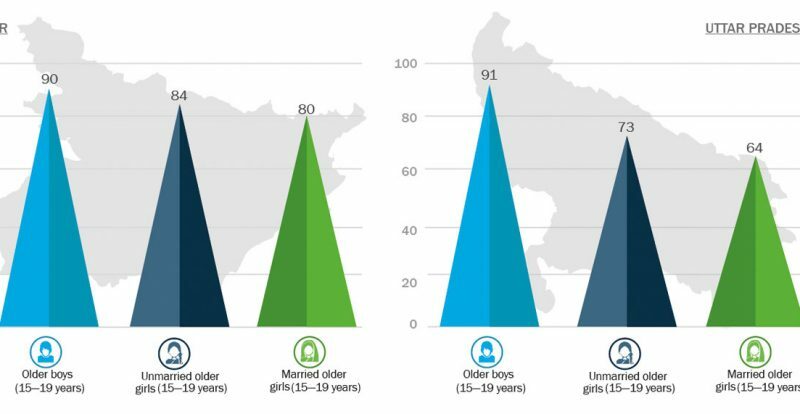 Boys had greater mobility than girls, regardless of the location, age, and residence in rural or urban areas. Even younger boys had more mobility than girls, irrespective of the age of girls and—among older girls—marital status. Older adolescents were more likely than younger adolescents to report independent decisionmaking. Notably, unmarried and married older girls were only as likely as younger (but not older) boys to make independent decisions. 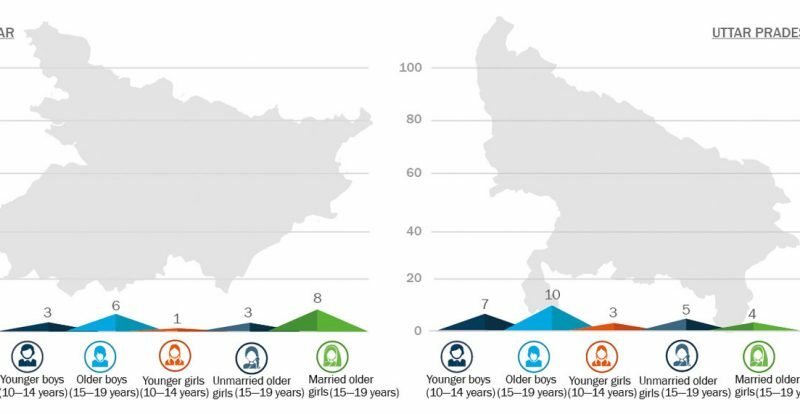 Amongst younger adolescents (10–14 years old), nearly one in two boys in Bihar and two-thirds in Uttar Pradesh, could make decisions regarding his choice of friends, going to a friend’s house, and schooling. Only two in five girls reported participating in these decisions. 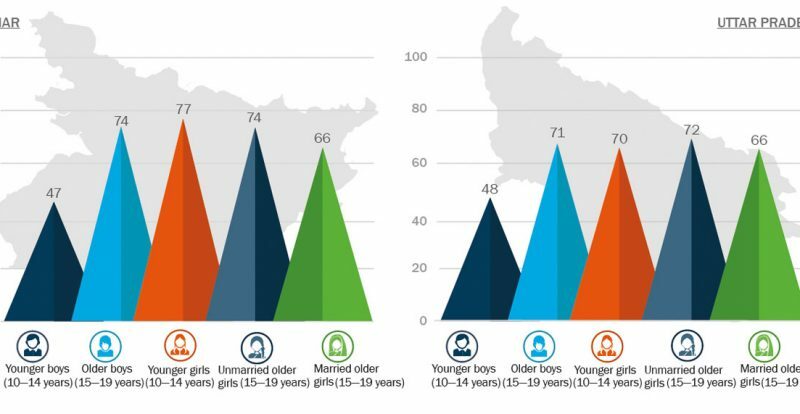 Among older adolescents as well, boys (31 percent in Bihar and 52 percent in Uttar Pradesh) had greater participation in decisions like level of schooling, major household purchases, and whether to work, compared to older adolescent girls (23–30 percent). Mobility within the village or urban ward was less restricted than mobility outside the village or ward, irrespective of age or gender. The mobility of married older girls was more restricted than that of unmarried older girls. 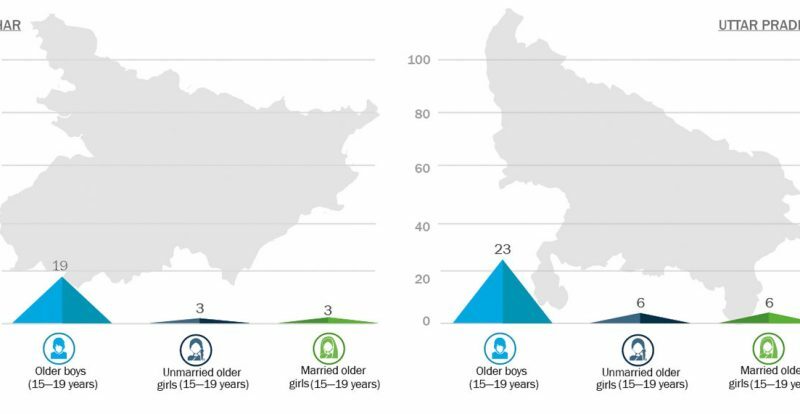 Only one in every seven married girls (15–19 years old) in Uttar Pradesh and one in five in Bihar were allowed to move in and around the village or ward unescorted, compared to two-fifths to one-half of the unmarried adolescent girls (15–19 years old). 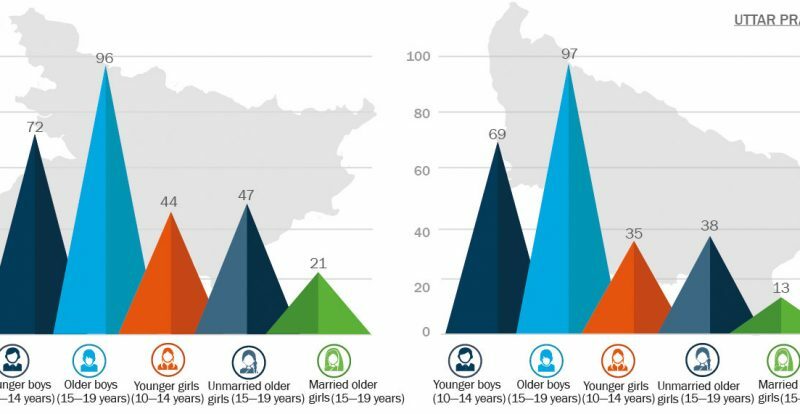 Over 90 percent of older adolescent boys reported they would interact freely with people of other castes and religions, but fewer—67 percent—were open to eating with a person of another caste/religion. 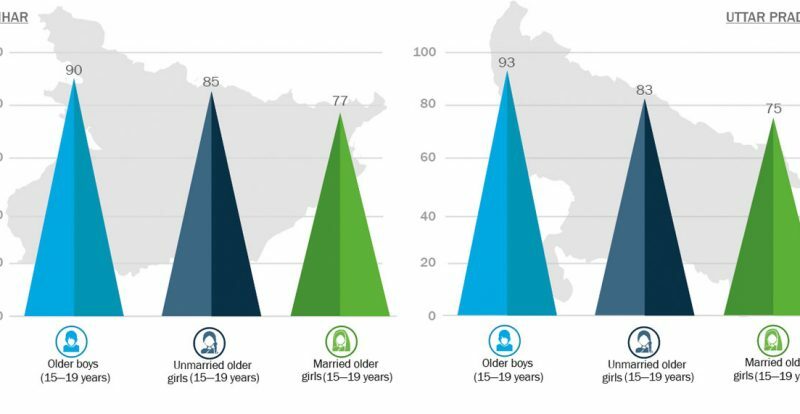 Likewise, while 73–90 percent of unmarried older girls were open to mixing freely with people of other castes and religions, only 56–68 percent expressed no discomfort in eating with a person of another caste/religion. Boys were more active than girls in political activities. Some 20–22 percent of boys aged 15–19 years had been involved in political activities, compared to 3–6 percent of girls. 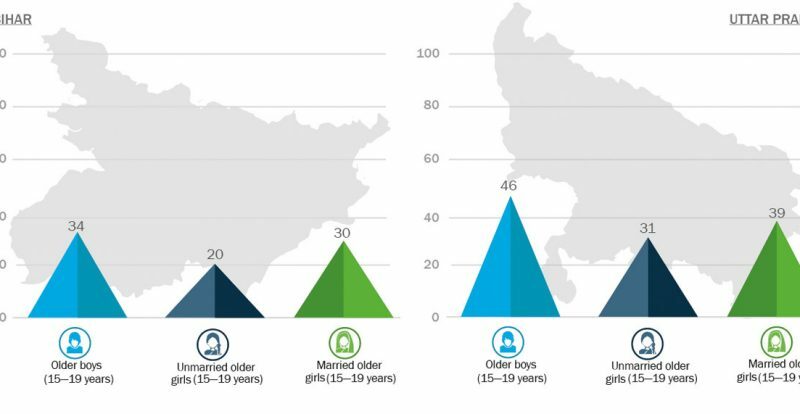 In Bihar and Uttar Pradesh, more adolescent boys (18–19 years old) than girls (18–19 years old) had voted in the last elections. 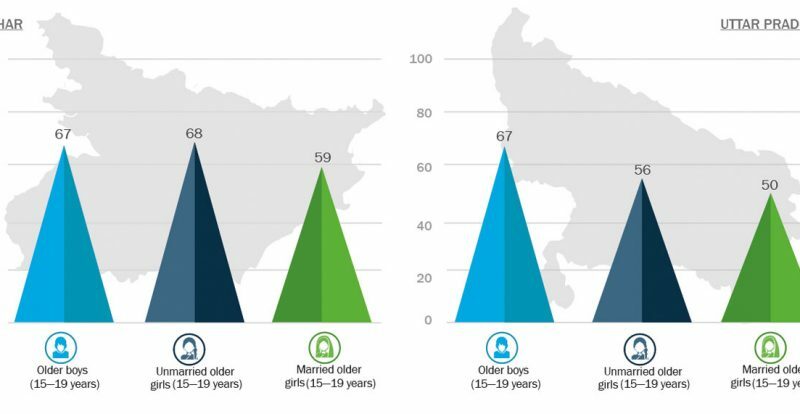 In both states, larger proportions of rural boys and married girls had voted in the last election compared to their urban counterparts. 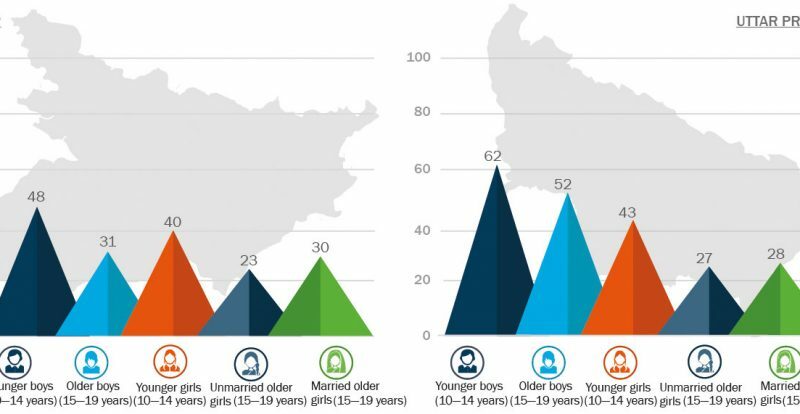 More married adolescent girls (18–19 years old) had cast their vote in the last elections than unmarried adolescent girls (18–19 years old).